Massachusetts Congressional Democratic Candidate Tahirah Amatul Wadud addresses a gathering. 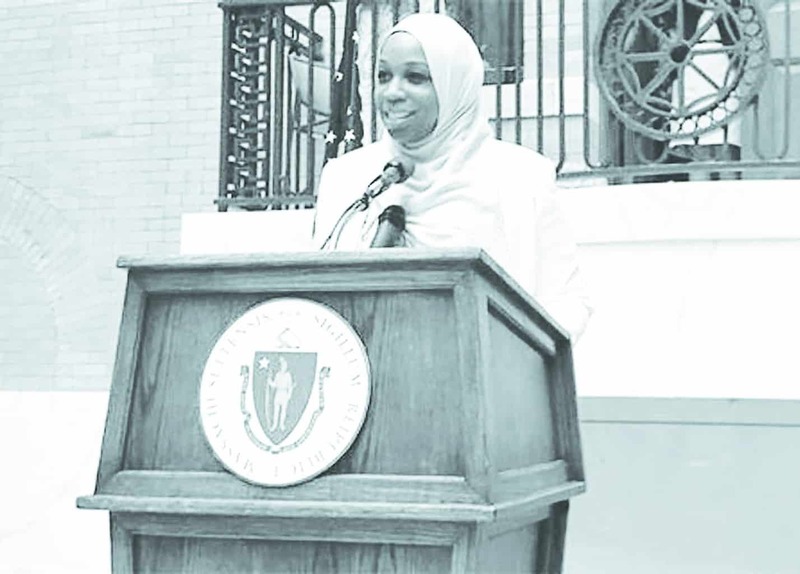 Recently, Massachusetts 1st Congressional District candidate Tahirah Amatul-Wadud was the target of a hate-filled operation which involved mailing fliers to citizens in her district, attacking not only the candidate personally but also the religion of Islam. Regrettably, these types of incursions against Muslims, people of color, and other minorities have returned to is not the exception, but the rule. Political attacks, the likes of which Mrs. Amatul-Wadud has experienced, and their attempts to raise suspicion and doubt about the legitimacy and motives of patriotic American Muslims, are patently un-American. Nevertheless, these tactics are directly from the playbook of far-right extremists. Fear-mongering, coupled with intimidation and voter suppression has been the modus operandi, often well-executed, since the founding of our nation. It is well documented that the rise of Islamophobia and targeted attacks against Muslims (not to mention Hindus and Sikhs, as well) have been a disturbing reality in the 21st century. Alarmingly, the current administration has not-so-subtly further emboldened groups and individuals to ramp up their barrage of aggression toward peace-loving American Muslims. While the “Muslim Ban” has garnered international notoriety, perhaps the most egregious illustration of the disdain toward dutiful Muslim Americans has been the defilement of The Gold Star family, Khizr and Ghazala Khan. Their son, United States Army Captain Humayun Khan, was killed during the Iraq War in 2004. The relevance of the treatment of Mr. and Mrs. Khan cannot be overstated. It has thus been demonstrated, that even when American Muslims have paid the ultimate sacrifice, giving their lives in the service of our nation, their efforts are often not recognized and revered as should be the case, without exception. Doing so would concede an acknowledgment of the fact that patriotism and love of country are not mutually exclusive to being a Muslim in America. With this precedent as the template, no American Muslim who dares to step into the arena of public service will be spared from the attacks, lies, and innuendo of right-wing radicals and political operatives. The paradox is that in spite of mean-spirited and bigoted attacks on Muslims being prevalent, the level of political activism and engagement of minority groups, Muslims in particular, has demonstrably risen since the November 2016 presidential election. According to an article published in the Washington Post, nearly 100 American Muslims were reported to be running for political office across the country this year. Although this number is relatively small overall, the inception of American Muslims being more engaged in local, statewide and national elections has the potential to be monumental. Rashida Tlaib, a 2018 candidate for Michigan’s 13th Congressional District has predicted a “blue Muslim wave.” It is also worth noting that polls of American Muslim voters have highlighted a steady deviation away from Republican candidates toward Democratic candidates over the last five presidential cycles. Given the acquiescence of Republicans to the far-right extremists and their hatred of Muslims, one can expect this shift to continue.